Described as a “cupholder for sauce,” DipClip is the perfect accessory for passengers to safely enjoy their favorite condiments. Milkmen Design LLC launched its new and innovative product on Kickstarter yesterday in hopes of raising $10,000 for initial capital costs that would support the product launch. DipClip is an incredibly simple concept and an easy solution to a common problem. 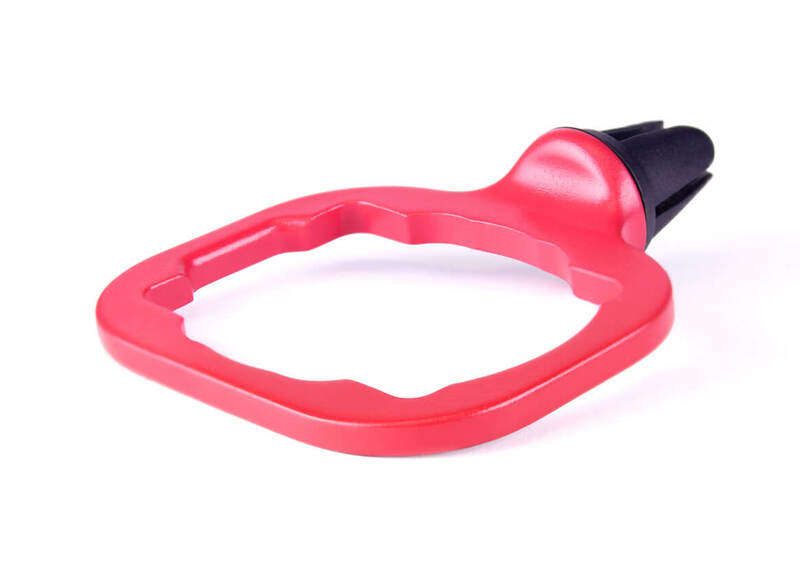 Users can fit DipClip in the front car vents or in the back seat vents in order to keep passengers from making a mess while eating. About 20 percent of all meals are consumed in a car, according to recent research. When not in use, the device is small enough to be stowed away in a glove box or center console. DipClip holds sauce containers from several major fast food restaurants — including McDonalds, Burger King, Wendy’s and Chic-Fil-A. During a short road trip, the team behind Ohio-based company Milkmen Design LLC, stopped at a fast food drive-thru to grab a quick bite. Quickly, members of the team realized they couldn’t properly enjoy their cuisine accompanied by their favorite condiments without having to risk making a mess. It was that moment, nearly 10 years ago, that the idea behind DipClip began to take shape. Utilizing a 3D printer, the team developed various prototypes and focused on creating a universal product. After prototypes, iterations, trial and error, DipClip was born. The final design fits virtually any car vent, and can firmly hold sauces and condiments. Expected to ship shortly after the campaign ends, DipClip is an ideal stocking stuffer. To learn more, and to check out the team’s humorous Kickstarter video, visit http://prfundl.ink/dipclip. Milkmen design is a group of highly dedicated designers, engineers, and entrepreneurs whose goal is to produce simple products that make people's lives better. The team is made up of three core members: Michael Koury, Tony Lahood, and William Moujaes, who all have very different areas of expertise. The three team members each took different paths to get to where they are today, but their unique interests and experiences in design, engineering, manufacturing, entrepreneurship, tomfoolery, finance and crowdfunding have prepared them to come together with one goal: to dream up solutions to problems that shouldn’t have existed in the first place. To learn more, visit https://www.milkmen.design/.